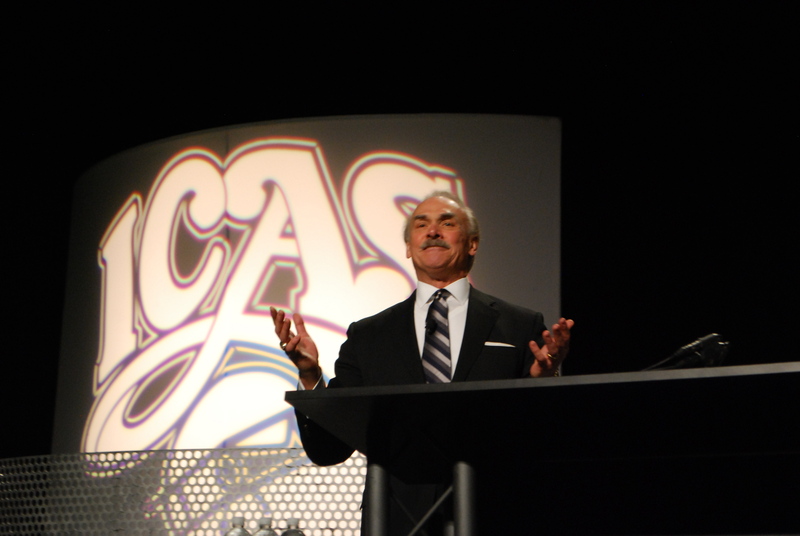 ICAS formally kicked off this morning with a keynote by Pittsburgh Steeler and Vietnam veteran Rocky Bleier. It takes a major personality to stand in front of a room like the convention room at ICAS, but a guy with four Super Bowl rings is probably just about right. Bleier spoke for about an hour, recounting his NFL experience, being injured in battle in Vietnam, and his path back into professional football. John Cudahy then announced the jet team schedules for 2013 and 2014, as well as the TAC DEMO schedules for 2013. It looks like the Thunderbirds will be back at Battle Creek next year and the Thunderbirds will be flying Oshkosh! The Blues will be at Indy next year and at Traverse City in 2014. These are, of course, the shows that are of most interest to me. Check the team websites for appearances near you. 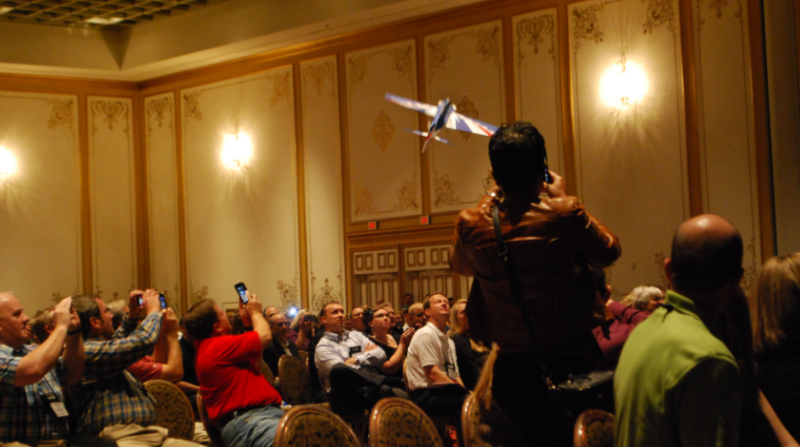 Probably the most interesting part about the morning session was an airshow. Yes, an airshow! Mark Leesburg and Jeff Boerboon launched radio controlled aircraft and pwned the pilots of the 1:1 -scale aircraft by flying a demo directly over the audience. I’m heading down to the exhibit floor now to see what’s new this year. More posts as more stuff happens! The low clouds and snow flurries retreated today and, as luck would have it, Capt Norm Malek and I had scheduled the G1000-equipped CAP C-182 all afternoon. So we launched around 1:00 and wrung out the aircraft for a total of 3.3 Hobbs hours. As of this morning, all of my approaches for instrument currency dated from October, which means that they’re going to expire next month. So I clearly needed some approaches. Capt Malek didn’t need as many, having recently flown some single-pilot actual as part of some aircraft repositioning work this week. This is a regular blog post. If you’re looking for show notes for audio and video episodes, you’ve come to the right place! Just scroll around and you’ll find ‘em! I’m almost decompressed from the weekend. 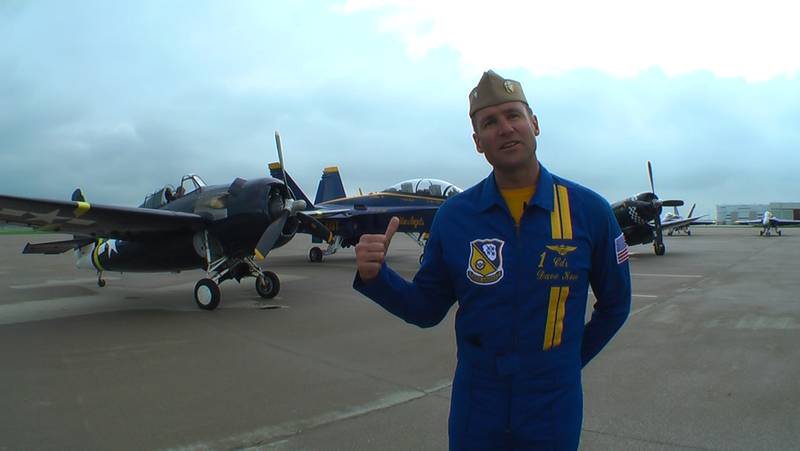 Saturday at Indy, I was invited to head over to Indianapolis International for an interview with CDR Dave Koss, Boss of the Blue Angels. They had lined up an F-4U Corsair, an FM-2 Wildcat, and an F/A-18D Hornet (Blue Angel jet No. 7) on the ramp as a backdrop highlighting the Centennial of Naval Aviation (“CONA” for short). I did my best to ask some nonstandard questions, but Boss is both well-prepared and enthusiastic. I asked him how all of the aircraft behind him were . . . wait for it . . . the same. He didn’t skip a beat. “The Naval Aviators who fly them.” And he’s dead right. 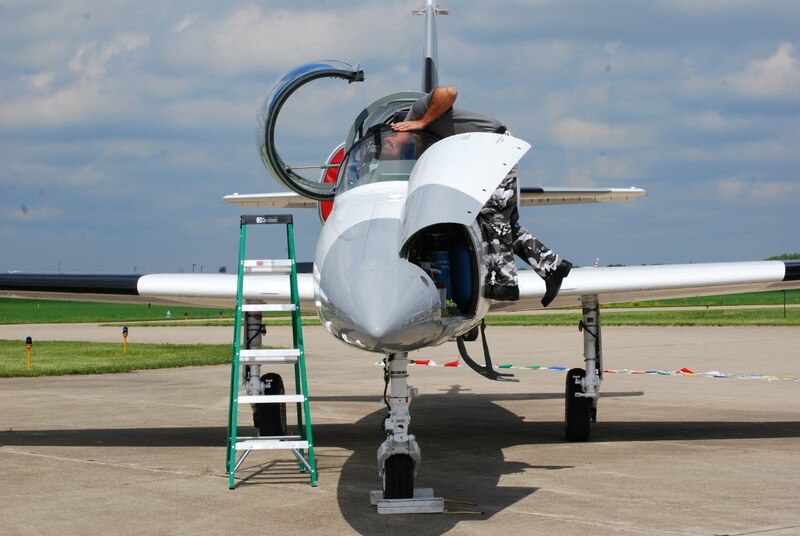 It was a short interview because it was raining and the Wildcat and Corsair had to beat feet back to indianapolis Regional (KMQJ), where they were on static display. But it turned into a really good three or four minutes that I’ll likely edit into an episode for the show. I might also try to grab a piece of it to use in Acro Camp. The remainder of the weekend was also pretty epic. I got home around 0400 local on Sunday morning. 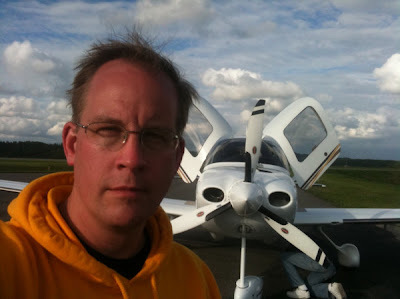 After a reasonably full day of domestic bliss, I met up with Don Weaver at Pontiac (KPTK) and proceeded to knock out my long commercial cross-country by repositioning a Cirrus SR22 (N711CG) from Pontiac Raleigh-Durham (KRDU) via Mansfield, Ohio (KMFD) and Upshur County, West Virginia (W22). We were inside the eggshell from about 1,200 AGL off of KPTK all the way to KMFD. We shot the ILS to 300 feet in actual with a stiff crosswind from the right. Later, we broke out of the clag and had some fun poking through fat, ragged cumulus piles most of the way to W22. We cancelled IFR and landed at W22 for gas. It looked as though we’d be able to stay above the mountain ridges and below the clouds the rest of the way to KRDU, so we departed W22 VFR and had an amazing time navigating through the valleys and over the ridges using a sectional. The peaks were around 4,000 MSL and the clouds varied from 4,500 to 6,000. Plenty of room to stay legal both above and below. But it’s the kind of flying that makes you really work on your SA and keep all of the back doors available in case you round a corner and find out that the next cloud and the next peak are in contact. We landed at KRDU and buttoned up the airplane. Then we did an almost equally epic 13-hour dash back to KPTK in a rental car. We traded driving duties and whoever was the PND took on DJ duties, digging into the deepest depths of his iPod to introduce the PD to the best of the best in music and motor skills. Don went out and immediately bought Chris Thile’s Not All Who Wander Are Lost after we returned, so I was reasonably successful in my PND shifts. Now it’s back to the grind. Lots of interesting clients with interesting work. But I also have only a 100nm night cross-country to go in the aeronautical experience department to go, then it’s polish the maneuvers, get the written out of the way, and I’ll be ready to take the commercial checkride. Back to the trenches! Ttere’s a movie to edit and Battle Creek is only a few weeks away! This is a regular blog post. If you’re looking for show notes to audio or video episodes, they’re all here. Just keep scrolling! 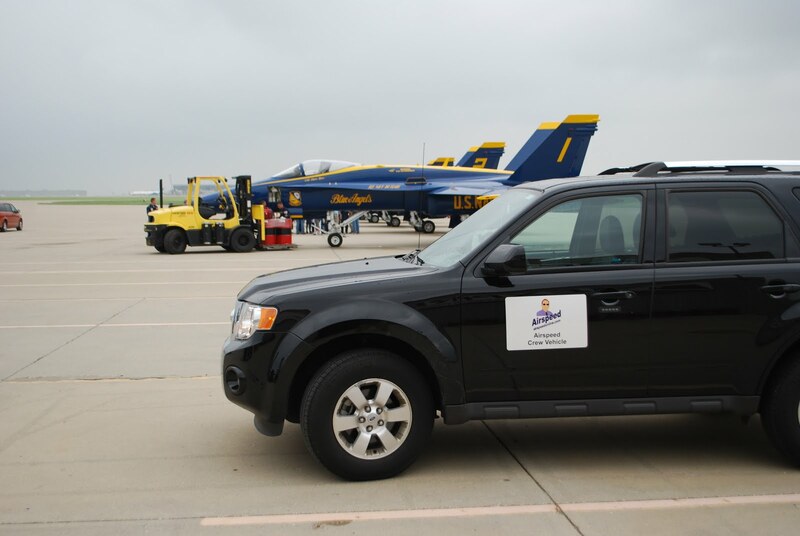 The Airspeed crew vehicle likes to think of itself as Blue Angel Zero. There she is, parked next to CDR David Koss’s No. 1 ship. Waiting for the crew to top up her smoke oil for tomorrow’s demo. Day 2 (Saturday) at Indy is complete. Worries about the weather were worth having, but – at the end of the day – not worth getting bunched up over. Ceilings started out high and gradually came down. The Blues flew a low or flat show, which was fine with me because I was on my way out to Indianapolis International to catch a photo op with CDR Koss and the pilots of two WWII-era predecessors of the F/A-18C. I opened up the sun roof so I could hear the jet noise better. The shoot went well and I got a three-minute piece that I might release as an ultra-short video episode. 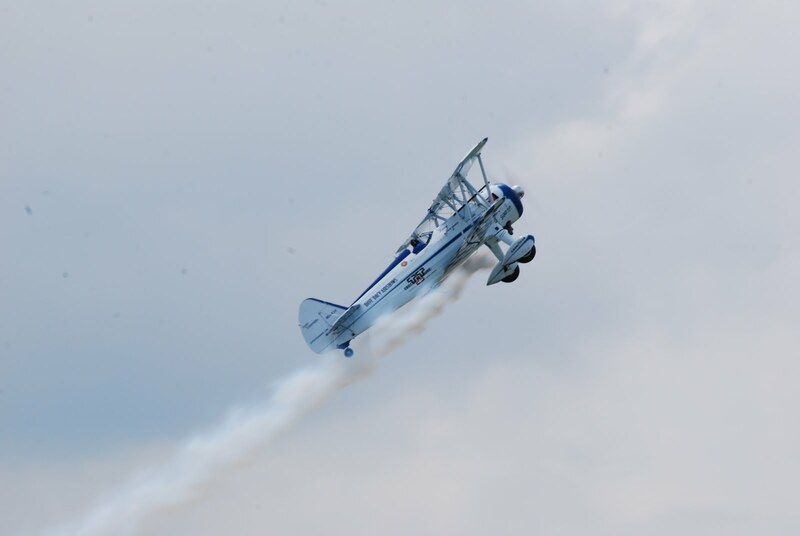 I love Dave Dacy’s big, honking 500-hp Super Stearman. It’s clean, it’s white, and it’s round. It makes the right noices. You can attach a human speed brake to the top wing. What more do you really need? 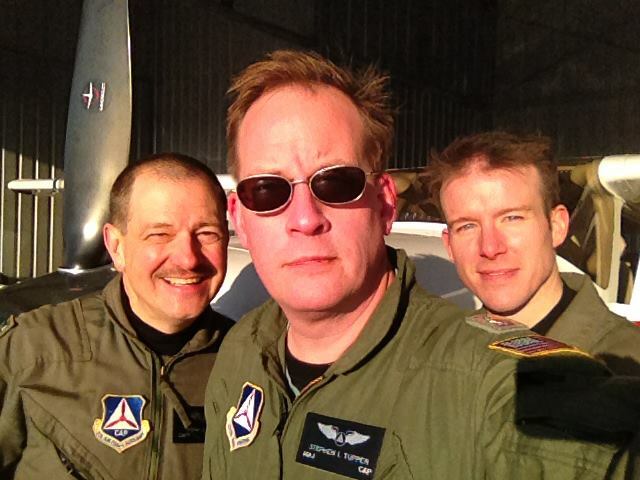 I hooked up with the Heavy Metal Jet Team in the late morning and got interviews with Snort and Slick for Acro Camp. The interviews look very crisp in HD. And they should. As long as the light doesn’t completely stink. you have an airplae that the team has gone to the trouble to paint with large areas of the three most useful background colors. Don’t like how the frame looks? Not popping? Take two steps to the left and you have a completely different contrast proposition. Three to choose from. No waiting. Both Slick and Snort are very, very well-spoken. Great answers to the questions and a sincerity that you can’t fake. Having interviewed about a dozen airshow performers for the movie, I have begun hearing substantially the same answer from multiple performers to the same question. It’s to be expected. There’s probably a limited universe of answers to the same core four or five questions. But both Snort and Slick had new, different, and dead-nuts-on things to say. I had to remember that I was asking questions and not just sitting in my living room watching the movie. I’m writing this at a Steak n Shake a couple of miles from Indianapolis International. I just offloaded the day’s still pictures from the camera and sent a couple off to the media folks at the airshow. Now it’s back on the road for Michigan. There’s an SR22 at Pontiac that needs to get to the Carolinas and Don Weaver and I are just the guys to take it there! This is a regular blog post. If you’re looking for show notes to a video or audio episode, you’ve come to the right place. Just keep scrolling. It’s all here! The Blue Angels are back again at the Indy Airshow. And that means that the ubiquitous blue and gold C-130, Fat Albert, is on the field supporting the Blues and thrilling spectators. And fanboys like me. Fat Albert is operated by an all-Marine aircrew. I had the opportunity once again to ride on Fat Albert. The first time (2009) was great. But I learned a few things that allowed me to prepare much better for this ride. For one thing, I showed up with five cameras. Four were small clampable models (two GoPro HD HEROes and two ContourHDs) and the fifth was the trusty Panasonic for handheld use. I checked in with GySgt Ben Chapman when we arrived at the aircraft staging area and he was kind enough to point out some good mount points. Two in the cockpit and two in the back. The best footage is from the cockpit camera, a frame grab from which appears at the beginning of this post. There’s a fair amount of vibration, but what mount in a C-130 doesn’t vibrate when you’re yanking and banking as much as this one did during the demo? Have you ever wondered what it looks like in the cockpit during the demo? Yep, that’s GySgt Chapman floating at the top of the climb-out as Capt Edward Jorge pushes the yoke full forward after a 45-degree initial ascent. I sat further aft than last time and I’m glad I did. The guys in the back do this all the time and are pretty good at knowing the flight profile and when they’re going to be at zero-G. And taking advantage of it. The shot above is not photoshopped. It’s the real deal. I got it from my seat with the hand-held. He has a good grip on the ladder and the ladder is firmly secured to the cargo deck. But it’s still pretty dramatic-looking. The main camera for the rear compartment was up on the front bulkhead looking back. It’s rock-solid and doesn’t vibrate. I’ll pull some frame grabs from that one and post them soon. 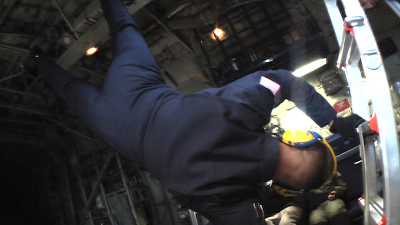 And, because all of the cameras ran the entire time, I’m going to synch them up so that the video episode is able to cut among the camera angles to giver you a pretty good idea of what it’s like to be among the pax on Fat Albert Airlines. 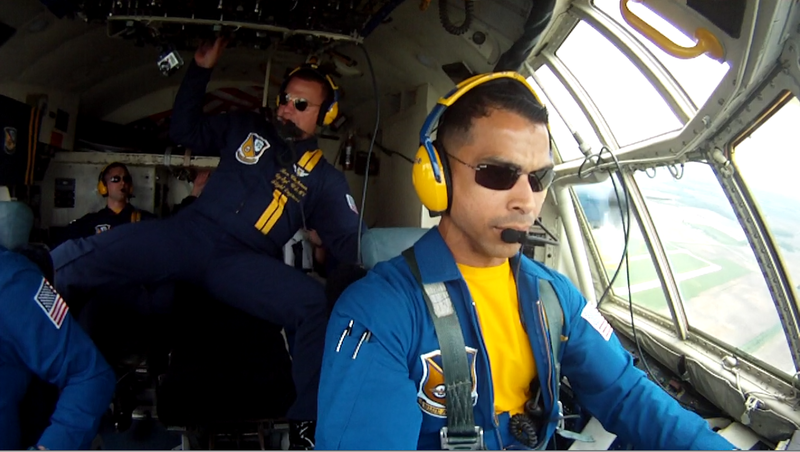 Thanks much to the crew of Fat Albert and to the Blue Angels! Watch for the video episode coming soon!